DIY.org is an online platform where youth (ages 6–16) can learn, discover, and share a wide range of skills. From baking to computer programming to astronomy and athletics, on DIY.org, youth can deeply explore of their personal interests and hobbies. The platform provides a digital space where young people can engage in multiple project-based activities, complete learning challenges, and interact with peers by commenting and liking the projects they share. In this case study, which is part of a larger effort that analyzes three different youth-oriented online learning platforms (Connected Camps, DIY.org, and Scratch), we showcase how DIY.org has been exemplary in revealing how safe spaces are created and sustained and describe the platform’s governance structure and moderation scheme. The case study is based on our own observations of the platform, as well as three semi-structured interviews conducted via telephone and email with three adult moderators (including the community manager) between October 2016 and May 2017. The case study is part of the Coding for All project — a collaboration between the Youth and Media project at the Berkman Klein Center for Internet & Society at Harvard University, the MIT Media Lab, and the Digital Media and Learning Hub at University of California-Irvine, with support of the National Science Foundation. Founded in 2012 by four American young adult entrepreneurs with experience in Internet video platforms, filmmaking, and youth education (Zach Klein, Isaiah Saxon, Daren Rabinovitch, Andrew Sliwinski), DIY.org has rapidly become home to a thriving community of youth passionate about making, learning, and discovering. According to DIY.org Community Manager Becky Margraf, the platform currently has more than half a million users (40% boys and 60% girls). Members of the community are mainly from the U.S (approximately 75%), Australia, Europe, and Japan, and primarily communicate in English. 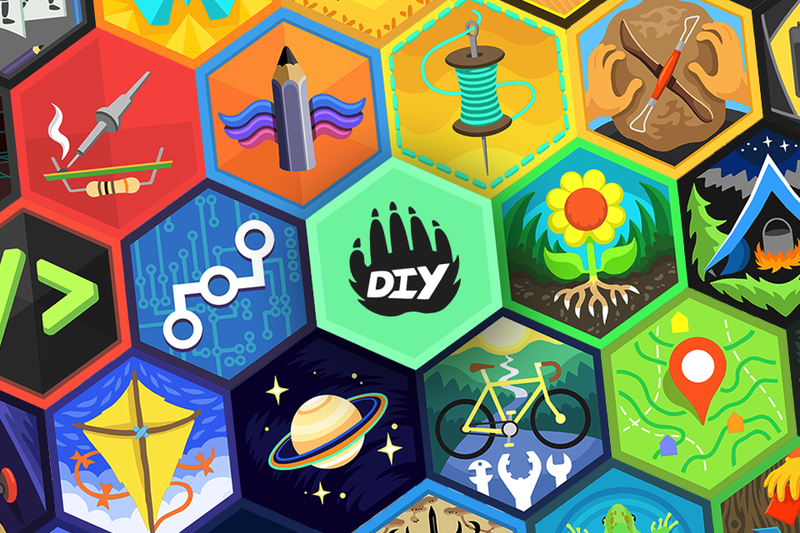 Today, DIY.org hosts more than 1 million projects and offers 130 different skill patches organized in 12 categories such as science, design, hacking, business, and athletics. These patches are visual representations of the skills youth gain by completing specific project-based activities (termed “challenges” on DIY.org) carefully curated and designed by DIY.org staff and other experts, including people from NASA, Mojang, and the LEGO Future Lab. For example, the “Sensor Hacker” patch encompasses more than 10 challenges, including, “make a robot follow a line,” “construct a pressure sensor,” and “build a musical theremin.” To successfully complete a challenge, youth publish posts that include visual documentation of their projects. 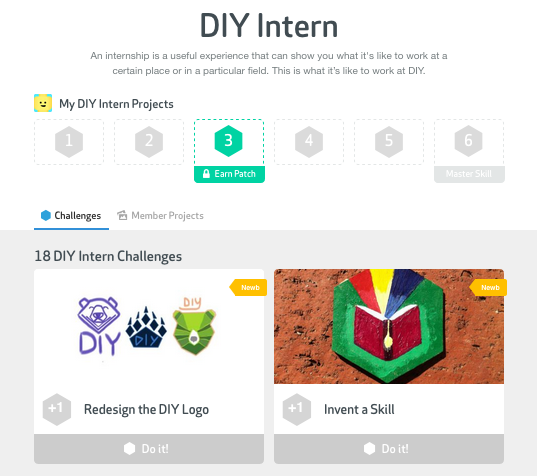 All DIY.org members can view, comment, and like the posts, and a dedicated team of adult moderators assess the projects to determine if the challenge has been completed. 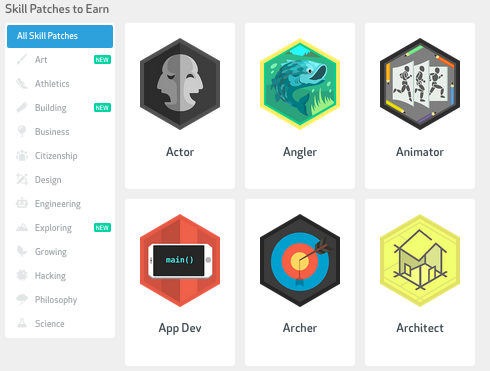 After successfully finishing three challenges, youth can earn a digital skill patch that is then added to their portfolio. Even with its massive growth — both in the number of active members and the amount of user-generated content being shared — DIY.org has been able to create and maintain a safe and positive environment where the risks of encountering inappropriate behavior and harmful speech (e.g. cyberbullying) have been minimized. In order to mitigate and address this type of conduct, the platform has combined several governance approaches for establishing and enforcing a set of shared principles and norms, and regulating and shaping the evolution of DIY.org. Adult moderators oversee all the content published on the platform with the help of automated word filters, while active community members flag objectionable content. Additionally, parents and teachers, who have read-only accounts linked to those of their children and students, respectively, can report inappropriate comments and posts, and remove project comments made by their children/students. Moreover, DIY.org has implemented a governance approach of pro-active modeling in order to foster positive behavior among members of the community. Adult moderators are highly visible on the platform and actively model prosocial behavior, while assuming public leadership and educational roles. By doing so, they are able to publicly perform examples of best practices and positive modes of conduct. DIY.org terms of service, policies (market, copyright, privacy), and community guidelines critically complement the governance approaches. Users accept and follow these policies and guidelines as they participate on the platform, while adult moderators enforce and promote them. The guidelines highlight values that are central to the culture of DIY. For example, “don’t be afraid to try,” and “don’t be lazy” encourage participation and experimentation. “Don’t be a troll” and “don’t spam,” and “don’t share passwords” help establish civility and privacy, respectively. Some affirmative principles include, “share what you know,” “show how you did it,” and “give feedback,” encouraging collaboration, peer learning, participation, and openness. “Be original” and “try new things” emphasize creativity, respect the copyright of others’ work, and experimentation. “Respect privacy,” “keep personal stuff private,” and “don’t share password,” reassure privacy. And “flag inappropriate comments” and “report troublemakers” invite users to monitor the activities of the community and participate in the moderation process. DIY.org’s governance approach relies on a hybrid moderation scheme that enforces community guidelines, curates, and filters content, and minimizes the risks of inappropriate conduct and harmful speech. Through this framework, a team of five adult moderators, including the community manager, oversees all comments and posts shared on the platform. Moderators use technical tools such as automated word filters for detecting unacceptable speech, a private internal chat software, and a flag system that collects reports submitted by users. Moreover, the DIY.org moderation scheme also includes the participation of active community members (including parents and teachers with read-only accounts) who flag objectionable content, and interns who help with some of the tasks typically performed by adult moderators. Moderating a youth-oriented platform is labor intensive. 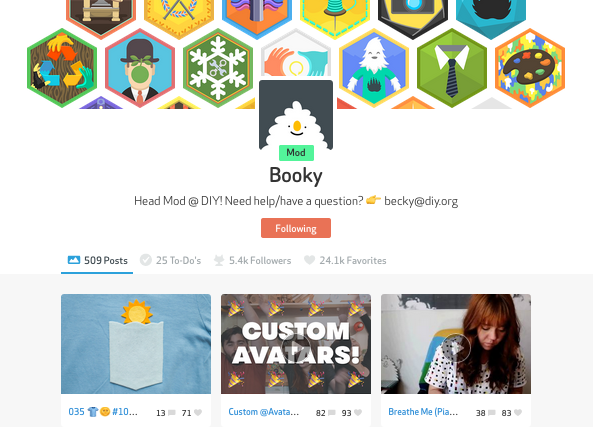 DIY.org adult moderators work full time, are paid, and perform multiple tasks and roles. For example, each moderator is tasked with monitoring and curating all the posts and comments that are published on the site; enforcing community guidelines by taking down content; blocking users that repeatedly break the rules; and assisting in solving conflicts among users. They are also responsible for assessing the projects posted by community members and approving them as evidence of challenge completion. Additionally, moderators assume public leadership and educational roles through organizing community events and contests, updating DIY.org skill content, and modeling positive behavior in the community. For instance, in the public space of DIYers’ projects comments, adult moderators are constantly providing positive feedback and asking questions that promote constructive conversations and knowledge exchange. Parents and educators with accounts also play an important role in DIY.org moderation. Their accounts are linked to one or several users and come with a unique dashboard feature for monitoring all the content that is associated with the linked users. Although these are read-only accounts, they can be used for both reporting objectionable content and removing content published by users with linked accounts. These accounts also grant permission to remove comments made by other users on their kids’ and students’ projects. Suspending posting privileges and banning users, however, is a task that only DIY.org adult moderators can execute. When users persistently act as “jerks and trolls,” “say something vicious,” “post bullying comments,” and repeatedly break the community guidelines, users lose the right to post comments and projects. In such cases, moderators require that the user contacts them via email, and, in some instances, will also try to get in touch with the user’s parents. If, after recovering the posting rights, the user continues to misbehave, moderators can permanently block the user and delete all the accounts associated with that user. One of the major tasks of DIY.org moderators is to assume public leadership within the community and ensure that the community adheres to the site’s core principles and values. The five moderators are highly visible actors on the platform and active participants in this public space. Like other DIYers, moderators post their own projects and comments, and complete challenges to gain skills. They also organize contests, review and approve projects, and help connect DIYers who have similar interests. By offering constructive feedback, recommending projects, and suggesting pathways that DIYers can take after completing a challenge, moderators are key actors in supporting learning. Our case study of DIY.org reveals how a youth-oriented online platform and community has built and sustained a safe digital space where youth (ages 6–16) can pursue interest-powered learning and engage in a “participatory culture” (Jenkins et al. 2006; Jenkins, Ito, and boyd 2016). In this kind of culture, members feel that their contributions matter, support each other while creating and sharing, and experience some degree of social connection with one another. On DIY.org, youth publish visual documentation of their hands-on projects, complete challenges, and give/receive constructive feedback to/from others in an environment where the risks of encountering inappropriate behavior and harmful speech have been minimized. As DIYers participate in the community, they are able to explore and gain a wide range of skills, connect with peers, and develop learning identities embracing the ethos of the Do-It-Yourself and maker movements. Establishing a governance approach in which both adults and youth can participate has been essential for creating and maintaining a safe space. Adult moderators (DIY.org staff), adult users (parents and teachers), and young community members perform complementary tasks. 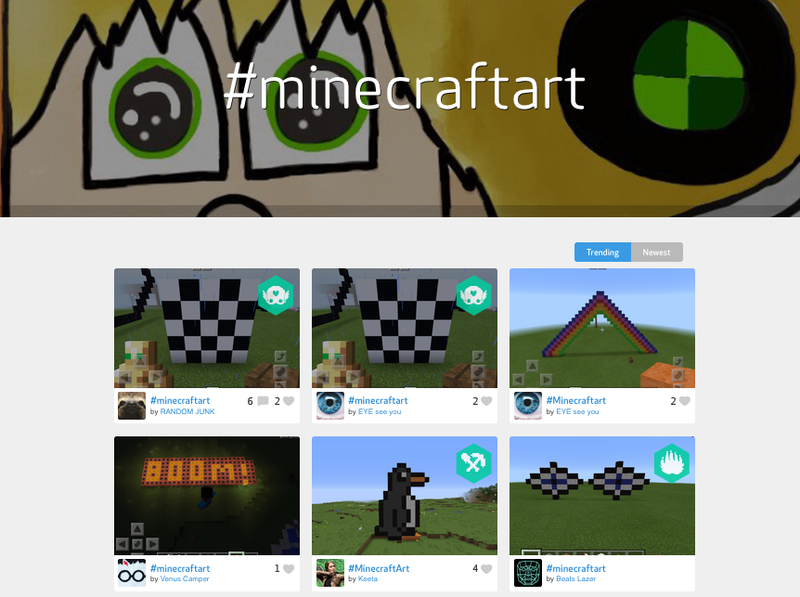 While DIY.org adult moderators enforce community guidelines, curate content, model behavior, and review projects, young community members help identify relevant projects, and flag and report inappropriate content. Parents and teachers, despite having restricted DIY.org accounts, participate by curating the content of the young users who are linked to them, and flagging objectionable material. The community guidelines — the platform’s set of core values — complement and promote this hybrid moderation scheme. The guidelines are stated in kid-friendly language and are used by both adults and youth to steer the community towards civility and growth. Finally, by building a digital space that is safe, diverse, and inclusive, DIY.org has been able to support interest-powered learning, with respect to a wide range of applied skills and vocational roles, while emphasizing the importance of communicating with others in a positive and constructive manner. Thus, as youth pursue their passions and discover new interests on DIY.org, they also learn about civil dialogue. This capacity for positive online behavior is essential for learning and participating in a digitally connected world.